It uses charcoal, wood or dry biomass fuel and produces next to no smoke! Enjoy eco-friendly outdoor cooking with the Versa stove. 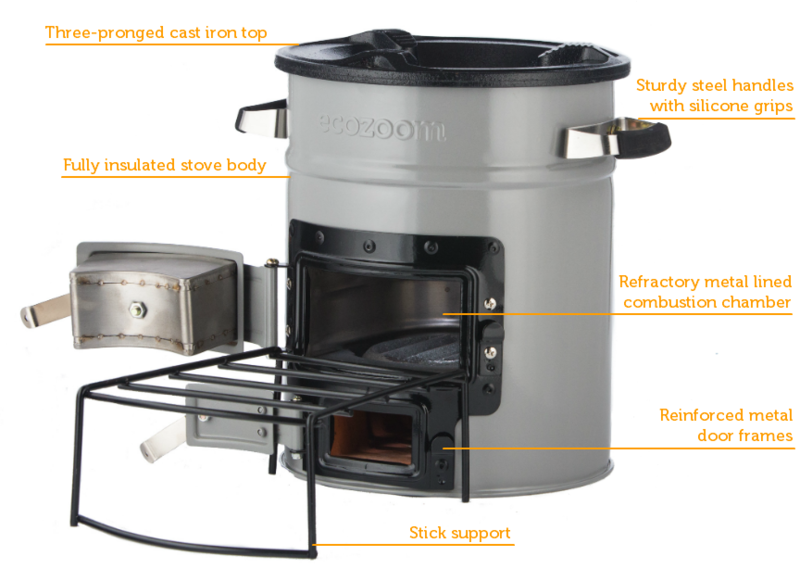 The EcoZoom Versa stove uses wood, charcoal or solid biomass fuel. It is perfect for camping, outdoor cooking and emergency preparedness and is the most popular model in the United States. The Versa provides the same efficiency and heat output as the Zoom Dura when cooking with wood and offers a more controlled cooking experience while using charcoal. The fully insulated vertical combustion chamber forces gases to mix with the flames, leading to decreased harmful emissions while boasting tremendous fuel efficiency. The top door and combustion chamber insulation is lined with refractory metal to provide ultimate durability. Both the main combustion chamber door and the damper door have reinforced metal frames with hinges to securely close the doors for regulation of airflow. The Versa has a durable three pronged cast iron stove top that can support a flat or round bottomed pan, as well as stainless steel handles with silicone grips to assist you in moving the stove. The Zoom Versa offers big power in a portable package, ideal for any outdoor cooking experience!